Alcatroz Xplorer Dock 1 BT comes well protected. 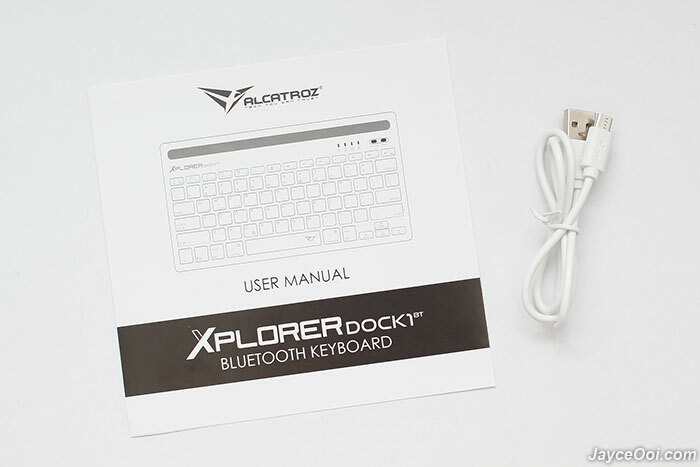 Once taken out, you can find USB charging cable and user manual. There are 4 colours to choose – 2 main black and white with different dock colours. 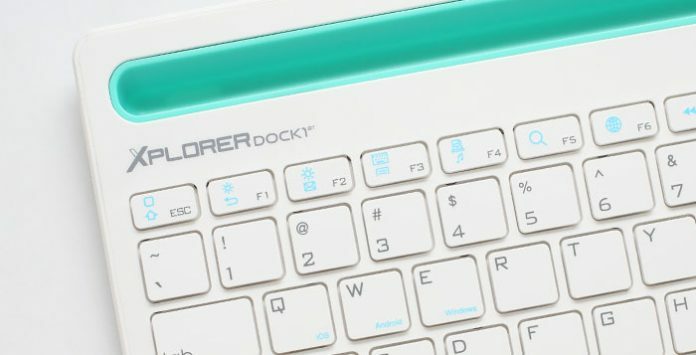 Build quality of Xplorer Dock 1 is excellent. Sturdy ABS housing and solid stainless steel inside I believe as it weight at 675g. Compact in size but you still get full-size keyboard layout (without numpad and insert, home & etc keys of course). Surely easy to carry around along with your tablet. No external dock is needed too. 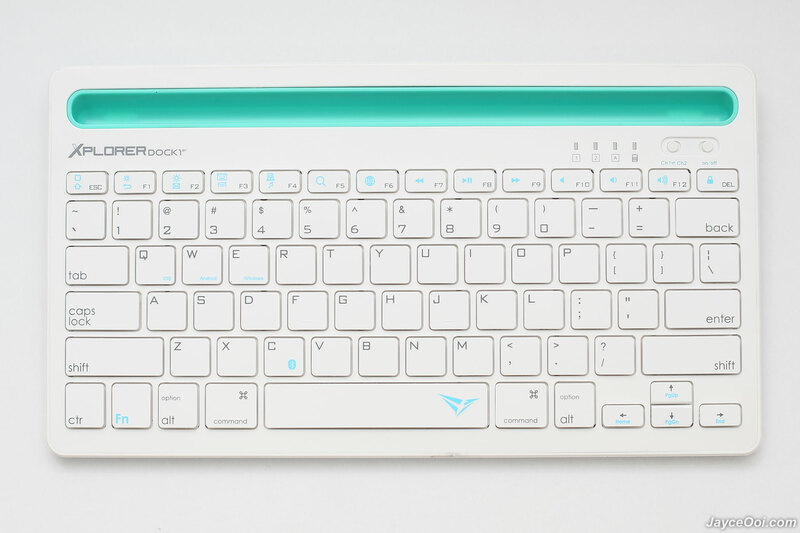 In addition, all the keys are UV coated to ensures longer durability when compare to the conventional silkscreened keypads. 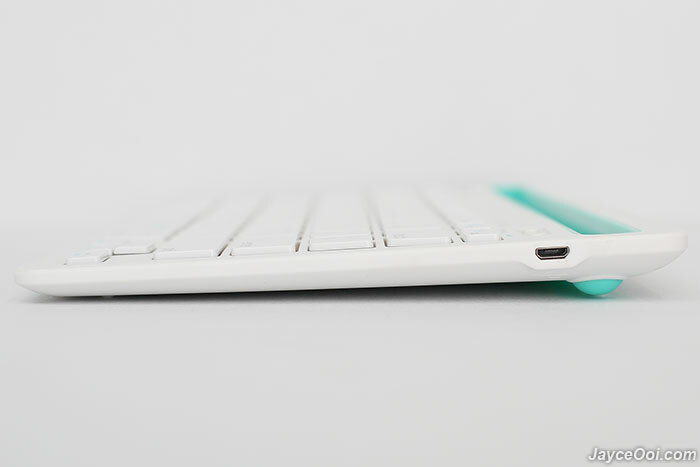 No height adjustment for ultra-slim keyboard here. 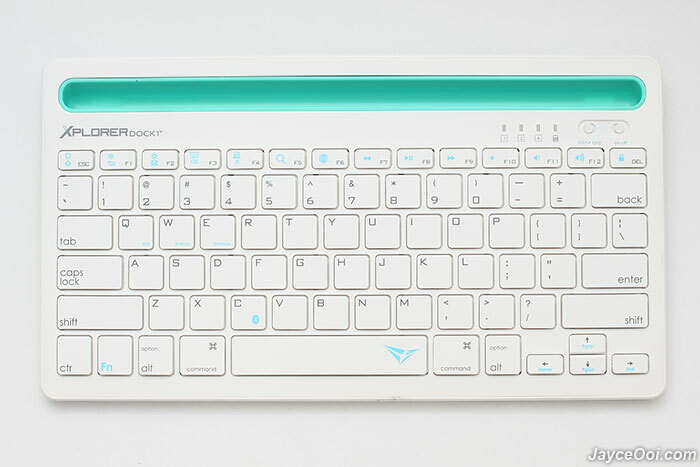 No worry, you get the same typing experience as typing on laptop’s keyboard. Check out those low profile keycaps and the micro USB charging port. As you can see, there are on/off and Ch1-Ch2 switches on top right corner. And LED light indicators for channel 1, 2, CAPS and battery life. 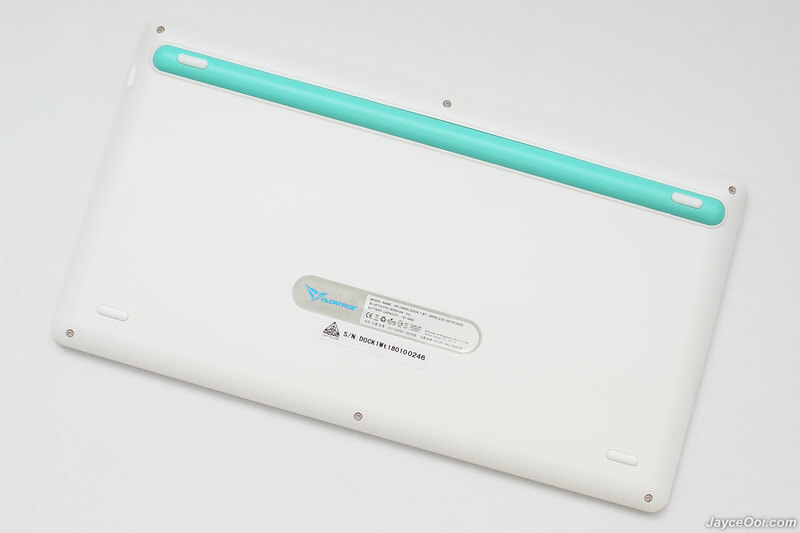 The long dock length is able to handle 10″ tablet easily. That’s great. Yes, Alcatroz Xplorer Dock 1 BT manages to dock a 10″ tablet like iPad 3 that I own. Or one smartphone with another 7″ tablet together. 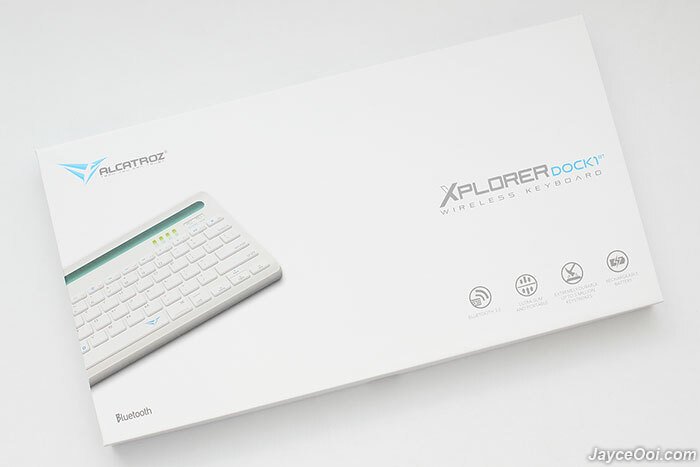 No worry about the tablet from falling as Xplorer Dock 1 does have some weight to hold it. That’s great but also increase total weight when carry around. Give and take here. 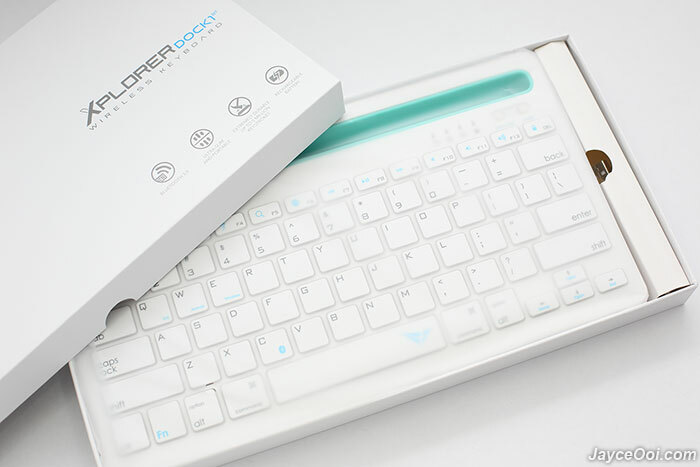 Anyhow, that’s what Xplorer Dock 1 special from other Bluetooth keyboard. No extra dock is needed for tablet and smartphone. Just put them in the slot and you are ready to type. 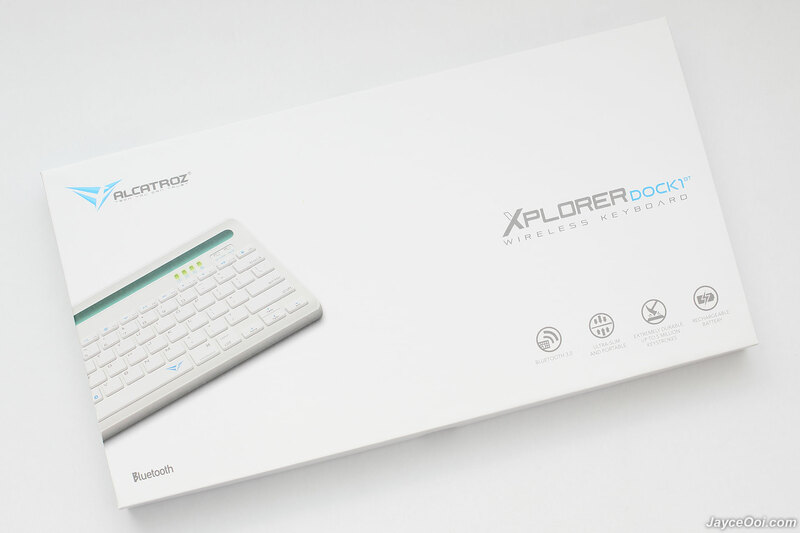 Xplorer Dock 1 passes the Bluetooth range test with flying colours. Easily pass the 10m test without obstacles. As long as you are in the same room with your devices, you are well connected. In addition, response is just as quickly as a wired keyboard. 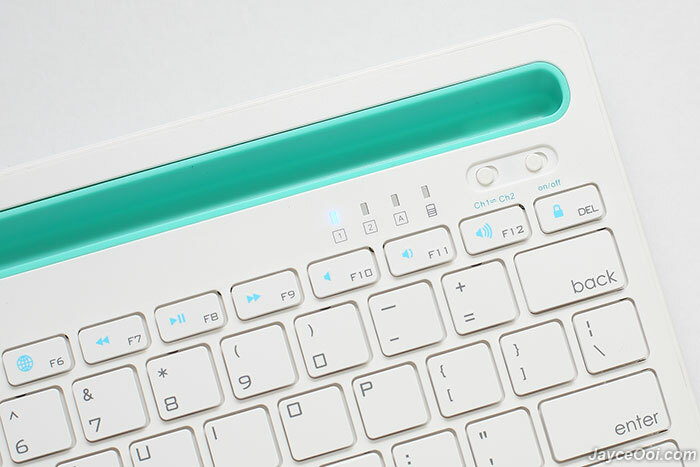 Perfect for typing and even on gaming too. Don’t forget the Multi-Pairing function which let you switch between devices easily. Yes, you can switches between 2 devices without having manual pairing process again and again. Example, Ch1 for Windows PC and Ch2 for Android smartphone. Very convenient as you can use it to reply SMS on smartphone then switch back for office work on tablet/PC then. There are blue LED light indicator that show you which profile you at now. And orange colour for caps lock indicator there. iOS, Android and Windows. Yes, Xplorer Dock 1 supports all of them. And comes with lot of useful shortcut Fn keys. You can launch shortcuts like search, change input languages, control media playback, volume and so on. Make your life easier no doubt. How is the battery life? As usual, I could not finish using the first charged battery after used for few days casually. Based on specs, it can last up to 4 months on standby. And 70 hours on continues usage. Take around 2 hours to fully charge. Note – it will enter sleep mode automatically after unused for 10 minutes to save battery life. 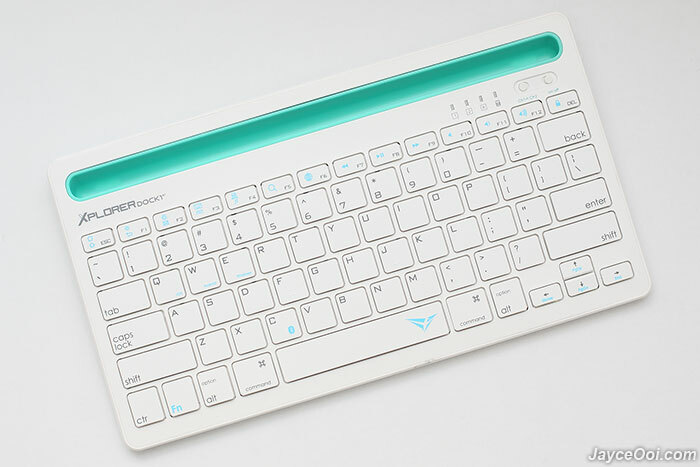 Typing experience is decent for a membrane keyboard. Shorter travel distance thanks to low profiles keycaps. Soft and silent too. Tactile feedback is good by the way. You can type fast on its low profile keycaps once get used to. Overall, it’s great to have Alcatroz Xplorer Dock 1 BT to work on multiple devices simultaneously. Much better than type with on-screen keyboard for sure. 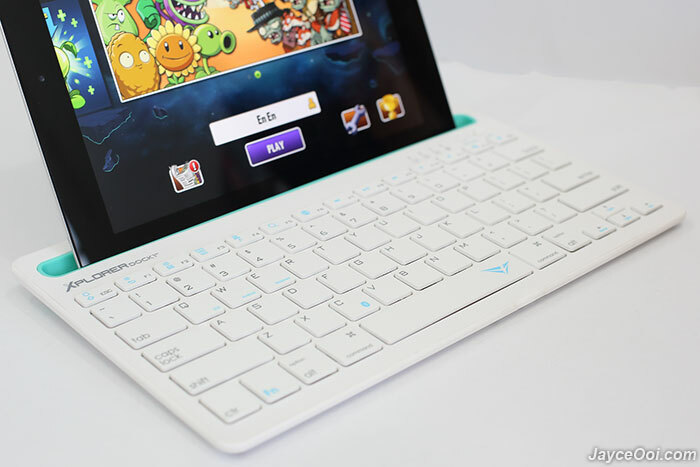 Want to own a wireless keyboard with tablet dock? Be sure to check out Alcatroz Xplorer Dock 1 BT. Work perfectly on all platforms like Windows, Android and iOS. 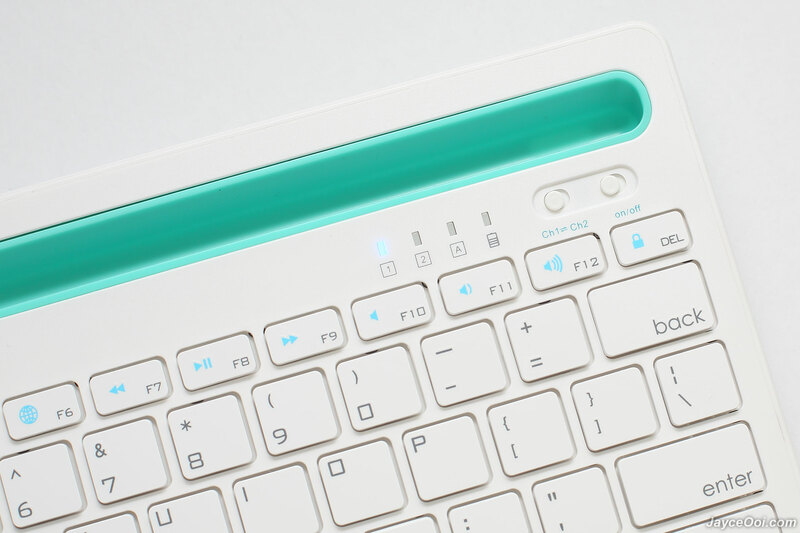 Super convenient to use on multiple devices thanks to Multi-Pairing function. Worry free with 2 years warranty. Interested? Do visit Alcatroz Website for more information. Get yours at Lazada.